The PD365 from Hytera is a business radio in pocket format. The compact design and intuitive operation make this DMR handheld your companion for reliable digital radio communication. The PD365 excels through its stylish and compact design in smartphone format and its intuitive operation. With a weight of only 160 g, it can be carried conveniently even on long working days. The PD365 was developed in compliance with the ETSI mobile radio standard Digital Mobile Radio (DMR). 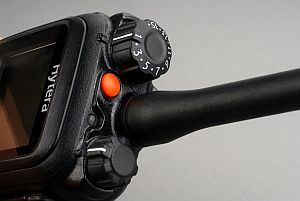 The handheld radio support the conventional DMR operation and can also be operated in analog mode. The unique integrated antenna design enables excellent availability without a large antenna on the handheld. The radios of the PD3 series offer not only many functions, but also a quick, no-nonsense start into digital mobile radio at a fair price. The lithium-ion batteries (2000 mAh) included in the delivery enable the PD365 to achieve an operating time of at least 12 hours in digital mode, with a duty cycle of 5-5-90. Attention: Due our distribution agreement with Hytera we may sell equipment exclusively for amateur radio, not for commercial radio. Thank you for your attention. The Hytera PD-505 is a simple 70cm DMR portable radio, which is easy to use and will still meet all what you need. This radio has no display and the memory is limited to 32 channels and 3 zones. In practice, this means that you can program all repeater around and not have to search the complete repeater list for the repeaters in the neighboring town. At the programming are no limits, so the user who is only interested in one talkgroup/time slot can store more repeater with these parameters. However, if you move from A to B, the programming must be adjusted. The simplified functionality is reflected in the significantly lower price compared to the other devices. The PD-505 needs not to hide behind the other handheld radios! Rather, the user, a device is given into the hand here, which its simple, intuitive and a faithful companion for every day. Of course, analog frequencies, and repeater between 400 and 470MHz can be stored in the PD-505. The device also has a CTCSS unit and can according to the programming work with. For outdoor use the PD-505 is waterproof with IP54. The PD685/PD685G handheld radio is the ideal companion for migrating to digital mobile radio. As a member of Hytera's PD6 series, the PD685/PD685G has a lightweight metal case and supports digital and analog mobile radio. Thanks to its full keypad, three programmable keys, and its bright LCD display, the PD685/PD685G offers a great user experience. The PD685G has the same features as the PD685, but is with a built-in GPS receiver. This allows your position displayed and transmitted. The handheld radios of the PD6 series are only 27 mm deep, making them particularly compact. They are encased in a high-quality aluminum metal frame and with a weight of only 310 g (PD685) comfortable and easy to carry for long operations. With the lithium-ion battery with 1500 mAh included in the delivery, the PD685/PD685G achieves an operating time in digital operation of at least 16 hours. With the optionally available 2000-mAh battery, it will even be 20 hours. The PD685/PD685G can be operated in TDMA Direct Mode and Pseudo Trunking. This assignment of the available bandwidth with double the number of channels leads to a significant easing of the increasing shortage of frequencies in the operation of DMR mobile radio systems compared to analog mobile radio systems. The frequency range in UHF stretches from 400 MHz to 527 MHz. The PD685/PD685G was developed in compliance with the ETSI mobile radio standard Digital Mobile Radio (DMR). The handheld radios support the conventional DMR operation and can also be operated in analog mode. That makes the PD685/PD685G the ideal companion for the move to digital mobile radio. Every radio of the PD6 series is also available with GPS. Variants with GPS support GIS applications, such as AVL and telemetry. The Hytera PD785 is a 70cm hand held device that supports the digital DMR standard. The PD785 offers with its ergonomic design a high operating comfort. A large TFT display and large size buttons, arrange a error-free operation under difficult Light conditions. For quick access to different services and features over 20 keys can be programmed individually. Even in noisy environments, the PD785 with this excellent voice quality ensures a good readability. Narrowband codec and digital error-correction technologies provide a stable signal even in poor conditions in the digital mode. Of course, you can work with this handheld radio also in normal analogue FM. The device has the requirements of MIL-STD 810 C/D/E/F/G standards. The PD785G has the same features as the PD785, but is with a built-in GPS receiver. This allows your position displayed and even short text messages are transmitted. The Hytera X1P is a 70cm DMR handheld with built-in GPS, which is only 21mm thick. A clever design and versatile functionality in a rugged design make this device so special. In addition to the normal connections the X1P has also installed a Bluetooth module and a USB interface. The development of custom applications is easy in this way and also these interfaces are a decided plus. The device is waterproof with IP67 and so the ideal companion for outdoor activities. The built-in GPS module not only displays the current position, but can also be used for GIS applications (Geographic Information System). The AES encryption algorithm and the 40 to 256 bit digit encryption keys ensure secure communication. The X1p supports BT earpieces from Hytera, facilitating operations including PTT. An open USB port facilitates secondary and application development. The built-in GPS module supports GIS applications (geographic information system). By supporting analog and digital operation, the X1p ensures a smooth migration from analog to digital. Versatile voice calls include individual call, group call and all-call. Like the other DMR terminals from Hytera, the X1p supports the use of both timeslots in direct mode. In direct mode two calls can be held in the same area at the same time. Supports multiple advanced analog signalling techniques, including HDC1200, DTMF, 2-tone * and 5-tone, providing more expansion capacity. Upgradable software enables new features. By changing the firmware software the radio can be used for DMR Tier II or DMR Tier III without buying a new radio. HY-BL1809 available again in early Dezember.